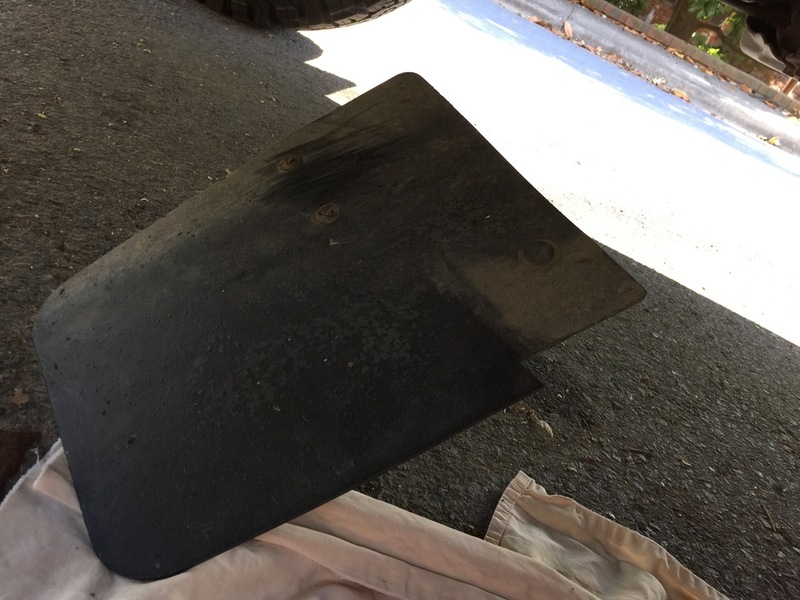 It's pretty easy for most "car guys", but I removed the mudflap and thought I would post some photos incase someone else was searching for it. 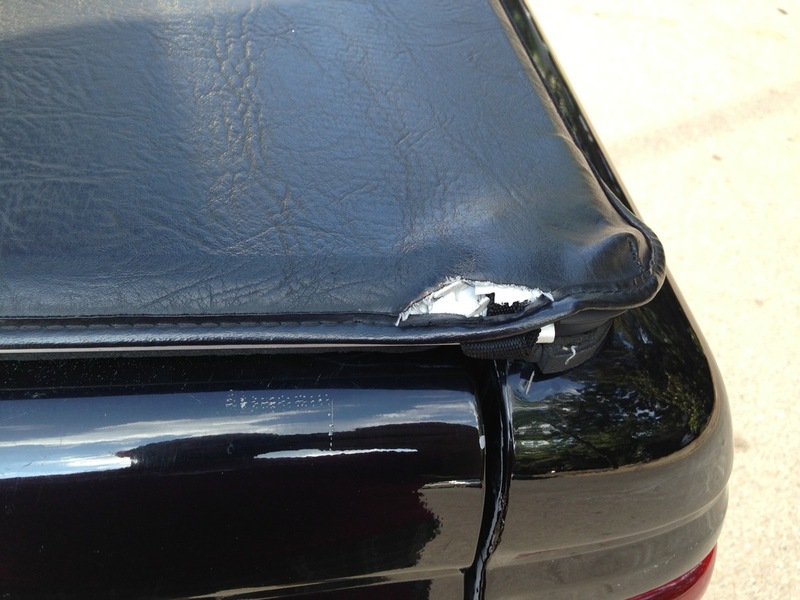 The mudflap is attached to a metal bracket support that is attached to the frame of the truck. Unscrew that support. 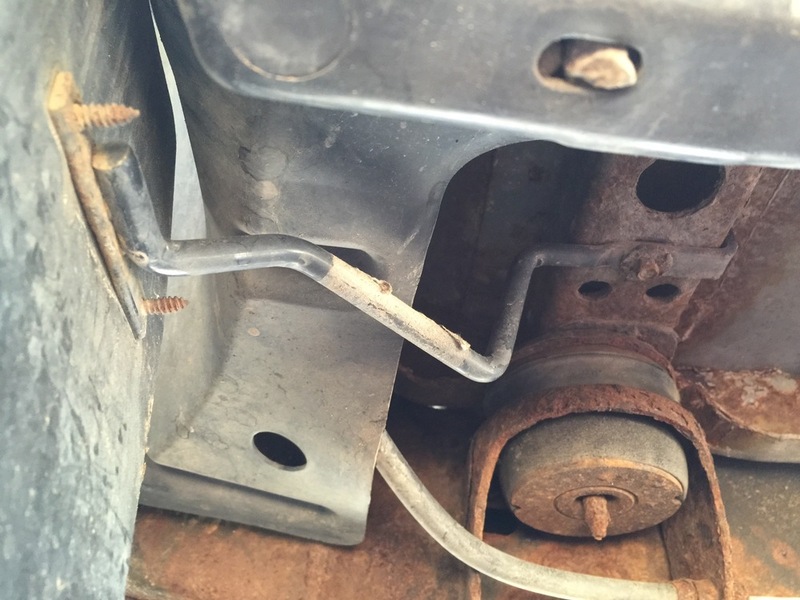 Mine started to unscrew and then broke off due to the rust on my truck. I used an 8mm socket. The second place the mudflap is attached is behind the plastic flare with what I think is called a "christmas tree screw"? I could be wrong about that but it is the kind of screw that goes in easy, but is hard to pull out. It is also plastic. Tugging, wiggling, and using a flat head screw driver to get some leverage snapped it right out. 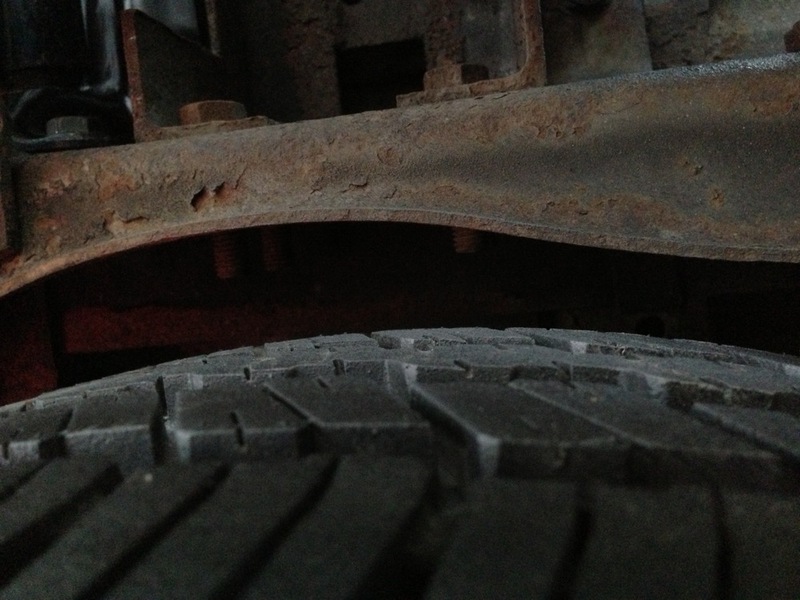 The rubbing stopped except for a very specific angle, at slow speed, in the front driver side. 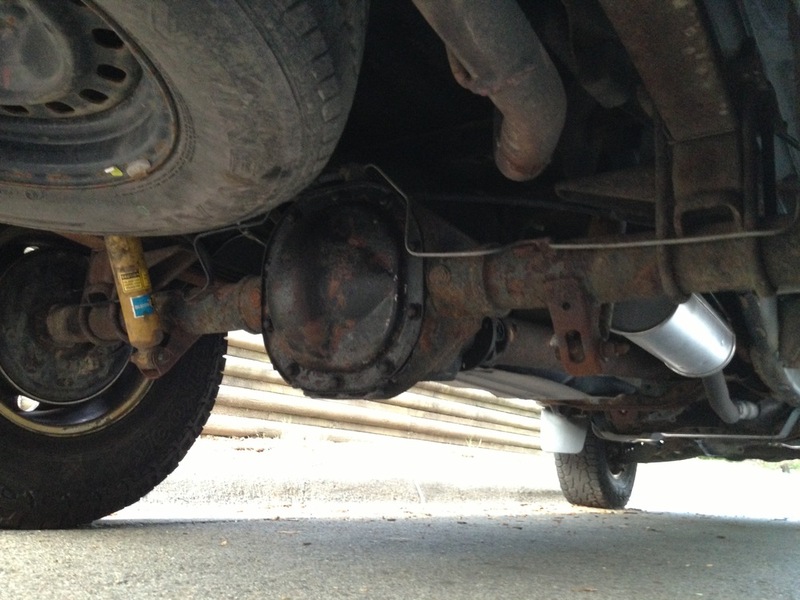 There is a small part of the bumper that hooks back under the truck that will occasionally hit it. It does not happen on the passenger side. It is rare and "OK" for now. On my list of improvements is a black front bumper that works with existing tow hooks. Changing the bumper will probably correct the issue. Vincent has new kicks! 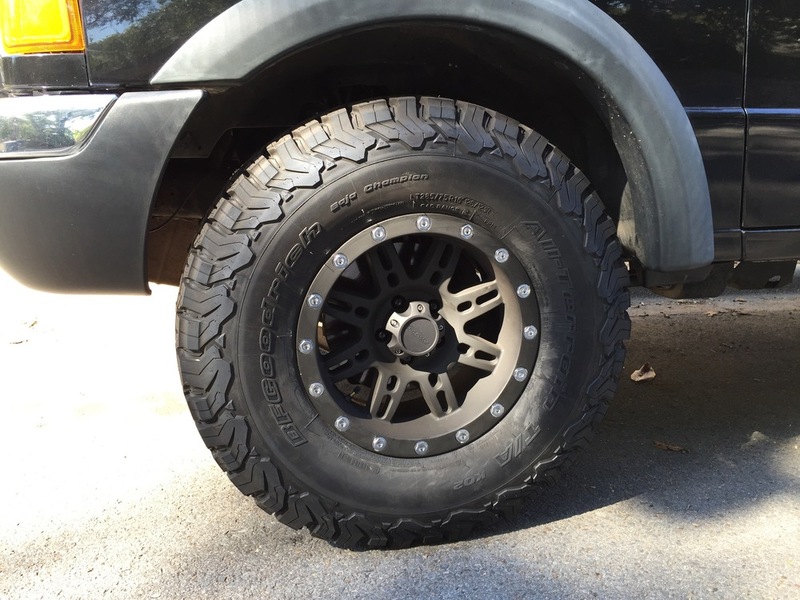 One of the first things I wanted to do was purchase new tires. I was once fearful of stoplights, on a hill, in the rain! Because I was able to get a great deal on the tires, I picked up a 5th full size tire to rotate in as a spare. This should prolong the life of the tires. The spare will live on the roof of the car eventually. After installing the tires, I noticed a slight "rub" coming from the front when I turned sharp and slow. My truck seems to have a TBar lift on it, not a body kit. After circling a parking lot a few times, I determined that it was due to the mudflap on the front. Removing those is next on the list. 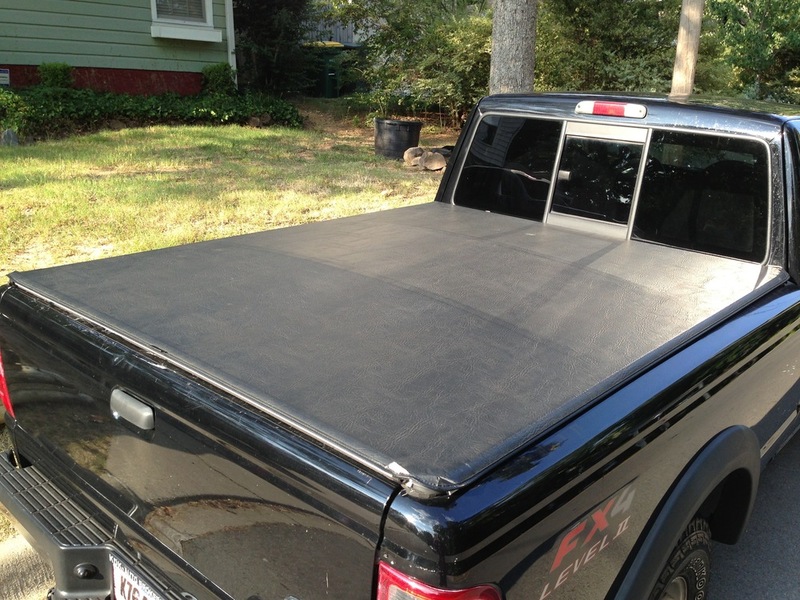 Just posting a few photos here of what the truck looks like with the console removed. The top armrest cracked and the bottom of the armrest broke off and would not stay. I removed it, but didn't like what the console looked like without it, so I removed the whole thing. The plan is to use a Ram Mount to replace it, hold several radios, switches, etc. 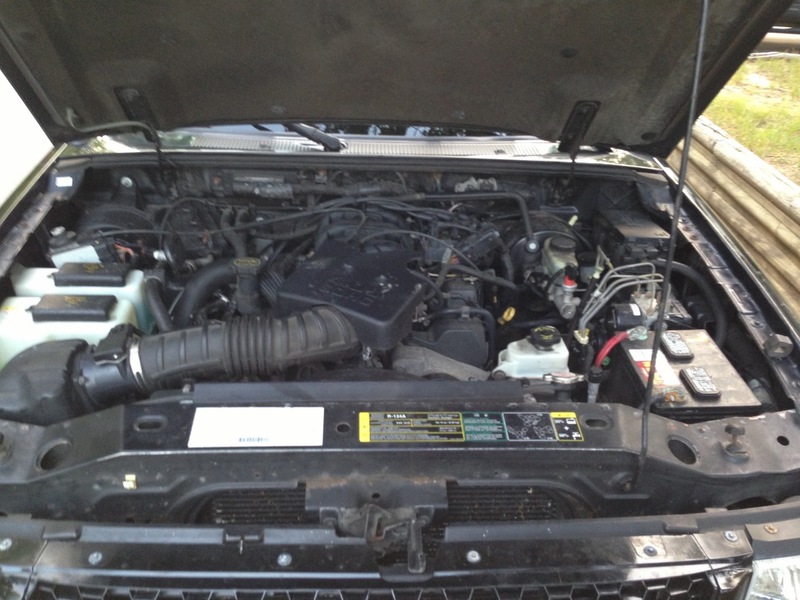 Vincent, the black 2003 Ford Ranger XLT, FX4, Level II, 4.0 SOHC, dual stick! I am excited to start this series of blog post. I am back dating this one to when the photos were taken. July 3rd, 2013. I am NEW to working on vehicles. Pretty sure I just heard several of you say, "This should be good." Yea. I know. We all have to start somewhere. Haha. No one in my family was into cars and I never grew up working on cars. So now I'm 33 and want to figure out how to work on cars. I'm a late starter, but at least I am starting! What did you drive before this? 1999 first car was a 1980 Nissan Datsun 280 ZX GL model straight 6. It was so fast. 2000 the little Datsun kept stalling, so we got a new 2000 Toyota Celica turbo four cylinder that I drove into the dirt. Then I got a new 2012 Subaru WRX who was pearl black and appropriately named Black Betty. She was sooo sleek and sooo fast. I loved that all wheel drive beauty. I sold it to help pay down the debt. 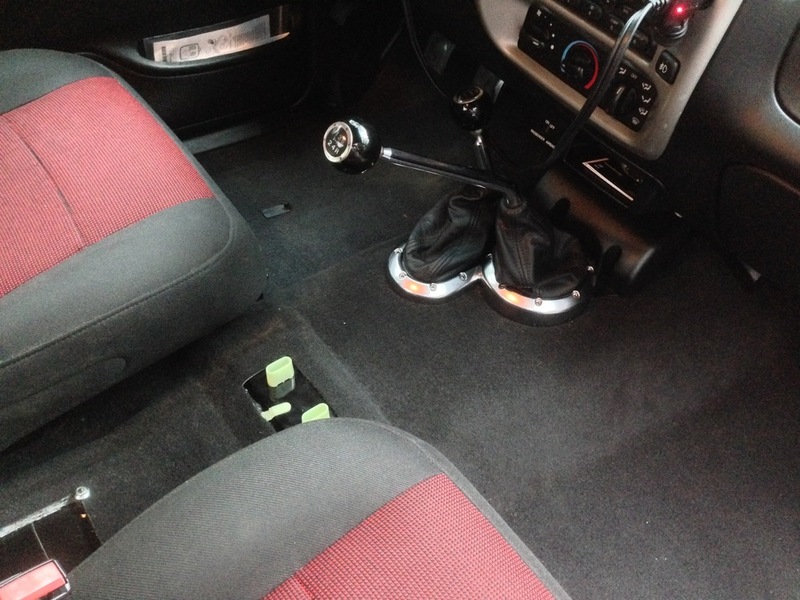 Now, 2003 Ford Ranger XLT, FX4 Level II, 4.0 SOHC, dual stick. 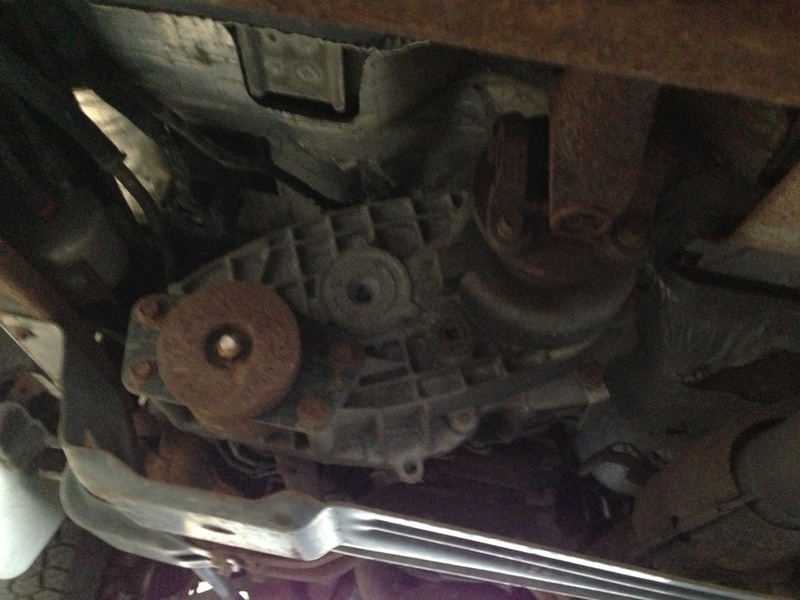 I purchased the truck from a broker in the north so there is more rust under the truck than I am used to. It had about 156K on it and I paid about $5500 for it after taxes and shipping. Was there anything wrong with it? I discovered it wasn't as good as it looked in the photos. But it would get the job done. 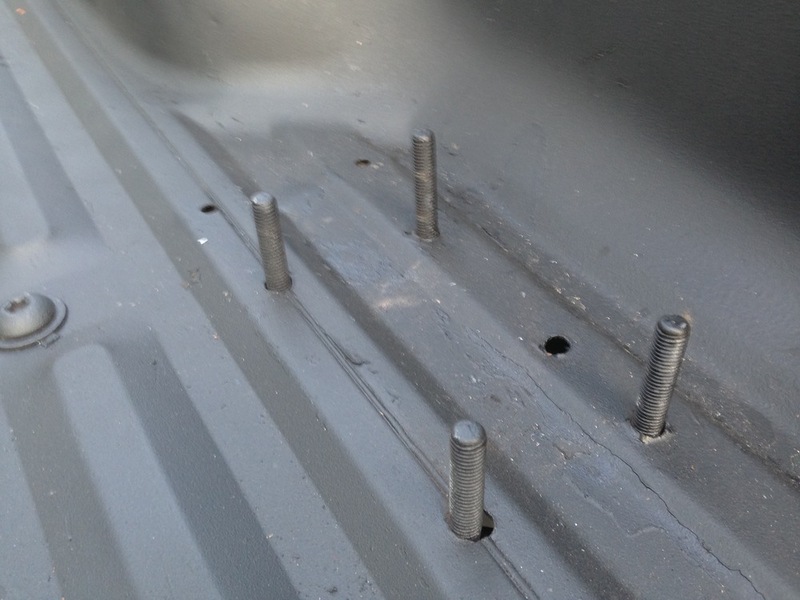 The truck bed had a cover over it and they had spray painted some sort of gray/black inside of the truck to cover up rust and some small holes in the bed and 4 weird bolts sticking up from the tailgate. No real definitive answer on what those were for. Those small rust holes have increased significantly in size. 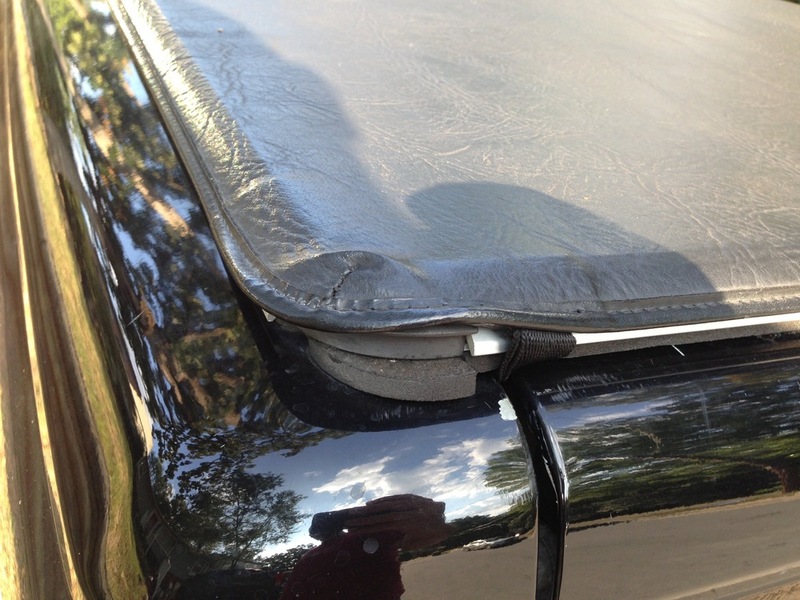 They also coated all the plastic with something that kept it black for a short time. Those pieces are now all gray. The tires looked OK when I got them, but were significantly worn. The driver seat adjusting thing is broken. If I stop fast or put too much pressure on the back of my seat, it falls back. Embarrassing in traffic. The AC went out last summer. Mechanic said "evaporator coil"? He wanted $800 for it. I drove with the windows down for 2 summers. The battery died and took the radio with it. I don't think the radio is completely dead, but I don't have the security code to get it to work again and the local ford dealer here won't help. They just tell me to bring it in and they will charge me $150 to "see" if they can fix it plus additional $$ to actually fix it. Huge rip off. The console arm rest cracked no the bottom side. I didn't noticed until I had to stop suddenly and the whole thing disintegrated. That stunk, but I was thinking about putting in a new console anyway. I would love to have a Ram Mount type of console and be able to mount a CB radio, ham radios and some other electronics with drinks, change, and some switches for lights and such. There is some significant rust on some parts. I might have to replace?? Mechanic said they will last for several years. My plan is to clean them, stop the rust, and hopefully maximize their life until I am ready to do a mod around it that I would have to change them out anyway. What do you want to do to it? Number 1, I need to fix most of the above. Then I can do some other stuff. 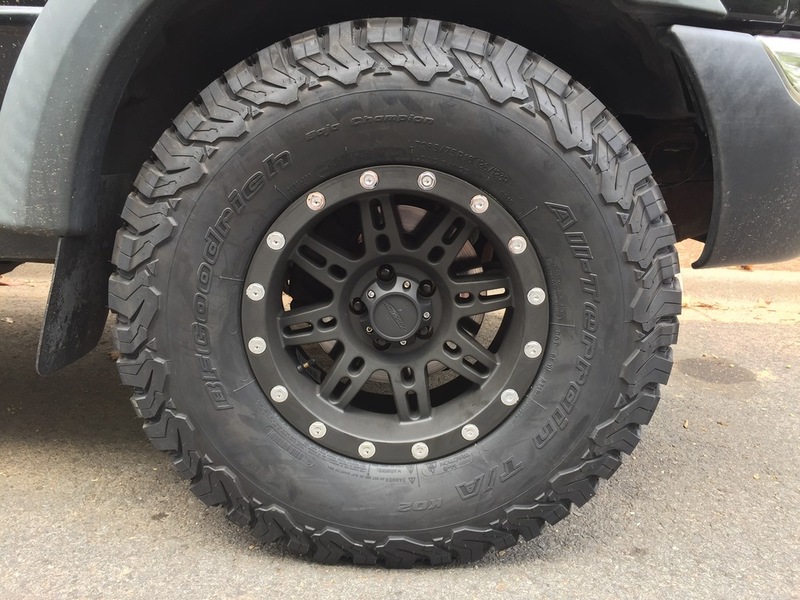 I am a Realtor by trade and this project truck will also be a very recognizable work vehicle around town, so I will have to keep it a little proper, very clean, but I want it to be off road capable. The full list is yet to come. The goal is for the truck to look nice, clean, black, and aggressive and have some accent LEDs. More on the full mod list later. Yea. I got the truck shortly after Vince Flynn passed away and the name Vincent just seemed to fit. I realize it is a guys name, but after driving Black Betty, this truck just doesn't feel very lady like. Take a look at the photos below. I know I am oversharing, but I really wanted to catalog the entire journey. If you notice anything not stock or mods/problems that a n00b wouldn't, please tell me. Thanks for checking out the thread!